Companies Are Still Foggy With Security in the Cloud. One of the questions we get most often is about cloud security. In fact, it’s one of the least understood areas for both penetration testing and security program building as cloud services such as Azure and AWS continue to grow. If I Move Everything to the Cloud, Isn’t Security the Vendor’s Problem? There’s a reason that privacy and security terms are some of the most heavily negotiated parts of cloud contracts. Unfortunately, it’s not just the cloud service vendors’ issue. ‘Who is responsible for what?’ is a critical aspect and one you need to make sure you get right. What Are the Trickiest Regulatory Issues I Should be Concerned About? We’ll discuss how you get on top of compliance requirements, policies and procedures, and the governance to ensure that all of the appropriate controls are met for the largest regulatory headaches. How do Cloud Penetration Tests Actually Work and What Are the Technical Concerns? As another attack surface, and with more and more companies moving to the cloud, it has increased in visibility for both hackers and companies alike. Should you be prepared to expect the unexpected, or are there common issues and misconfigurations that TrustedSec is seeing? What Are the Top Recommendations in Addition to What I’m Already Doing? Most everyone is already doing a lot (or at least spending a lot) to be secure. 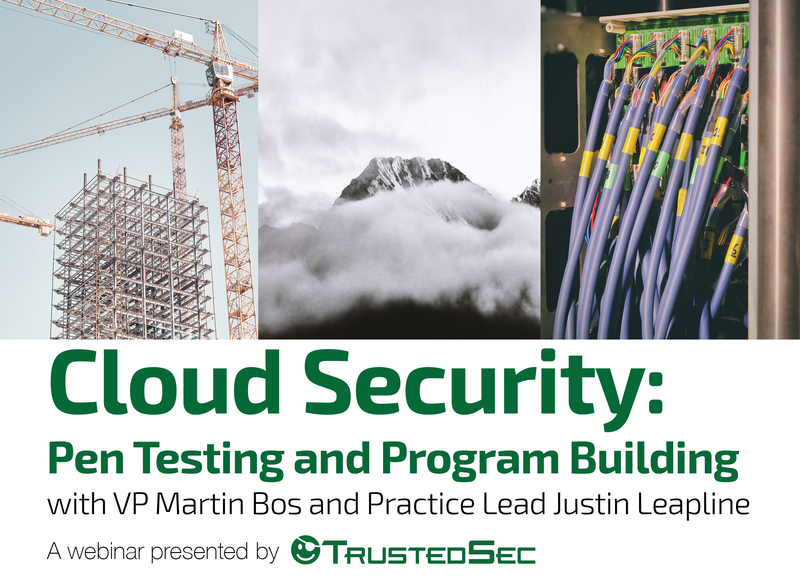 It’s important to know the similarities and differences in building your security program to deal with the expanding cloud security issues.